Robin Asbell is a Minnesota-based chef, food writer, and cooking teacher. Kate Sears is a New York–based photographer. "Big Vegan is the book I want to give to those asking questions about vegan nutrition and what to cook! It answers all the most asked questions in such a clear way and then escorts the reader right into exciting and easy recipes. This is a truly valuable addition to the book shelf." --Linda Long, author and photographer, Great Chefs Cook Vegan. If you had any doubts about the growth of veganism, pick up this book...if you can. Gorgeous, inviting, and amazingly well thought out, Big Vegan is a resource you'll be cooking from for years to come. It will also come in handy as a step stool when you need to fetch that rarely needed ingredient from the top shelf. "This cookbook isn't about narrow labels (vegan) or even intimidating expertise (cuisine) - it's about delicious, flavorful meals you make in your kitchen and eat with your family. In an age of ceaseless foodie hype, Robin delivers food you want to eat - Monday or any day!" 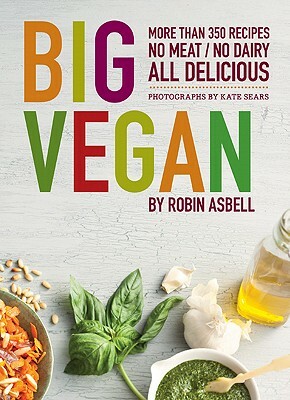 "In Big Vegan, Robin Asbell offers an exciting collection of healthy plant-based recipes, from simple to sophisticated, for everyone who loves high flavor food made with real ingredients. Big Vegan will keep new, merely curious, and longtime vegans supremely satisfied from breakfast to dessert." This paperback has the counter appeal and substance of a hardcover book. The chef-author's emphasis is on balancing sweet, salty, bitter, sour and umami.